The Malcontent: A Taylor-Made Idol? 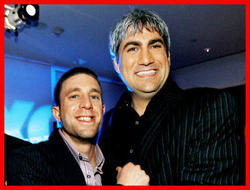 I loathe Taylor Hicks and the air he breathes to shout "woo" and the ground he twitch fits upon. BETTER THE PICK-LE THAN THE HICK-LE! In spite of mediocre singers this year, I don't think I can be cured of my AI addiction since I can't look away or stop listening as Paula provides feedback. You can't write this stuff. Heck, Paula can barely say it! I don't watch the show, but in the above picture are thier heads glued on someone elses body? Or is that really the way they hold thier heads? I feel so much better knowing that I am not the only person in the United States who finds Taylor annoying. That being said, I've yet to meet anyone who really likes him, so I'm not sure why he does so well in the voting each week. One small consolation is that he has - for the past few weeks at least - stopped yelling "WOOO!" at the end of each verse. i'm not sure what show you folks have been watching, but Taylor deserves to win. He may be spastic, but brother boy can sing anthing. bobbing around never hurt ray charles or stevie wonder. you don't have to see to hear. just the love and pleasure he gets out of every song he sings makes me want to dance around myself. TAYLOR ROCKS!